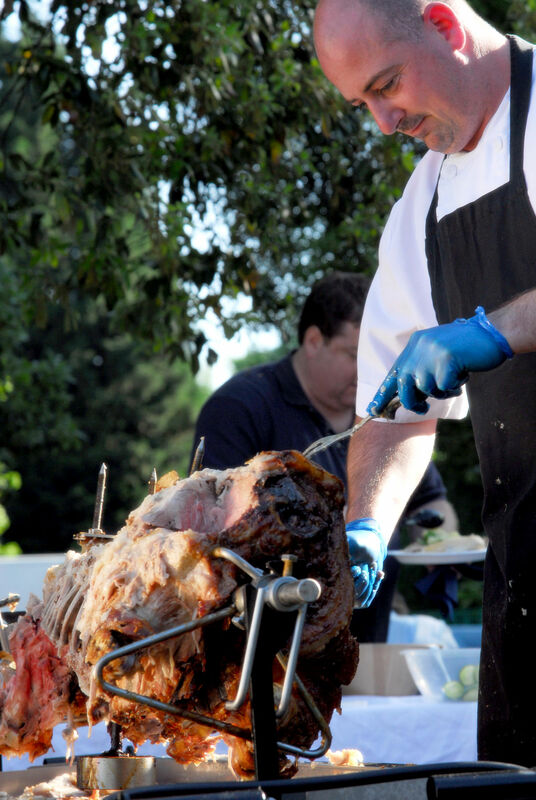 Please use the email form or give us a call to enquire about hog roast catering at your next event. Hog roasting may be seen by some as the preserve of medieval fairs and battle re-enactments, but, as we’ve learnt first hand, the demand for spit-roasted pig is soaring. As we’re at the forefront of Donegal hog roast catering in this part of the world, we seek to provide the best in tasty, luxurious and affordable indoor and outdoor catering, whether it’s for a party, corporate event or wedding. We’ve been in the hog roast catering business for a number of years, and have provided our services to people on both sides of the border, and have received praise from legions of happy customers. We’ve been to all corners of Ireland, serving our famous food to birthday parties with a hog roast in Bangor, business award ceremonies a hog roast in Enniskillen and Weddings with a hog roast in Lisburn. We’ve even hired out our hog roast machines to people to cook for barbecues at community events. It is very easy to get in touch with us to organise your next event and we always repy to every enquiry promptly. For the catering side of our business, we have detailed menus for different events. Our bespoke menus for Weddings, Private Parties and Corporate Events have the occasion in mind, and give you a choice of different menus, from the simple to the extravagant and everything in between. Our Private Party menu has something for every celebration. It fits the bill for birthdays, graduation ceremonies, retirement parties and works as an incredibly satisfying post-match meal. However, the menu is also ideal for other scenarios where you’re with your friends, work colleagues or loved ones. If you’re having relatives coming over from England, then why not welcome them with the heavenly taste of one of our hog roast buffets? It’ll help to make their visit even more memorable, and it’s a great way to show them your love. If you’re holidaying in Donegal during the summer, especially if with a large family, then ordering from our party menu could be a great way to sample local cuisine. We source all our ingredients locally, from the meat to everything that goes into our sauces, sides and desserts, so as well as a taste of the best hog roast catering there is, you’ll also be getting a taste of Ireland. 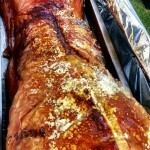 So get those Irish fingers tapping on the key board and fill in the enquiry form for a geat deal on hog roast catering. Our Corporate menu is equally tasty, and is the perfect antidote to humdrum buffets. As with every option on the party menu, we supply either a hog roast or another meat of your choice, plus extras ranging from bread rolls and sauce to a full-on corporate dining experience including canapés, potatoes, side salads and desserts. As for our wedding menu, it’s to die for. Knowing that you want everything to be perfect, we supply both a main meal and evening buffet with each option, with everything prepared, cooked and served to precision. You get your choice of spit-roasted meat, a selection of sides and rolls, plus, if you want even more, then we’ll also do desserts. Whatever you order from any of our catering menus, we’ll be able to come to the venue on time. We’ll arrive between six to eight hours before you want your food served, allowing us time to cook the meat on our hog-roasting machine, as well as everything else. We’ll even serve everything, and can stay at your event as long as you need. We’ll even clean up, and whatever’s left over is yours to keep. 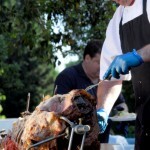 As well as catering, we also offer a hog roast machines hire service just like the one we use on all our catering jobs. For a very reasonable sum, you get full use of one for a whole week. You can cook whatever meat or vegetarian equivalent you desire with it for all sorts of indoor and outdoor events, and you’ll be amazed at both how easy they are to use and how good your food tastes when it’s done. 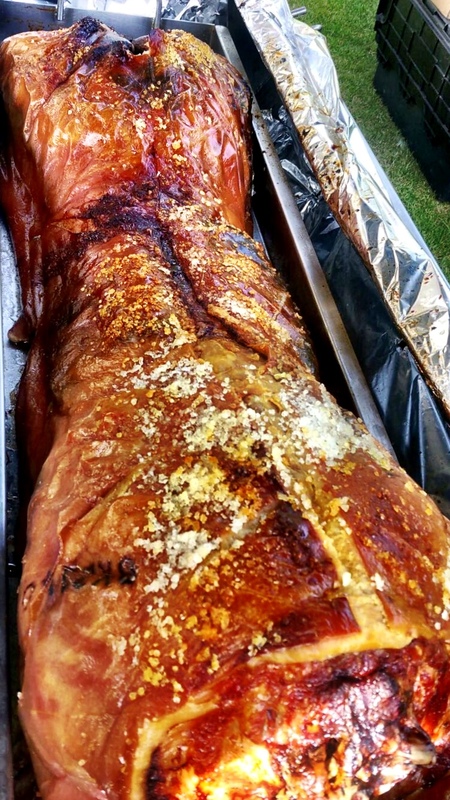 Hiring a hog roast machine makes perfect sense if you’re organising a big barbecue, outdoor event or if you own a restaurant or pub in Mayo and fancy serving your customers a hog roast. We can also provide a pig if you’ve never bought one before. When it comes to hog roast catering, whatever you need, we’ve got it. We have the best equipment there is if you want to hire it, and we provide mouth watering food for celebrations and functions. If you’re interested, then please feel free to drop us a line, and we’ll get in touch as soon as we can with the answer you’re looking for.